How long have you been a vegan? 9 years the rest vegetarian. Was transition easy? Yes, due to the lack of craving. Any tips/advice for someone interested in being a vegan? Find many alternatives and find reasons why you are vegan. Have strong morals. What's your favorite vegan recipe? Egusi African dish made with pumpkin seeds grounded. Or burritos. 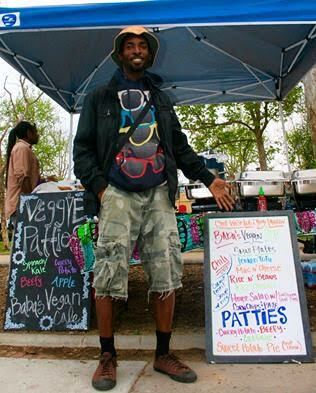 Black male vegans/vegetarians are rare but seems to be growing in popularity. Why do you think that is? Health and fitness. Vegans are sometimes known for being extreme. What's the one thing you want people to know about vegans? They make decisions every day like anyone else. Has it had an impact in other areas of your life? Relationships and differences with peers. We already have many events in Leimert, but one that solely promotes the essence of Leimert Park, its culture, and its future. The goal is to educate the community about holistic health and lifestyle. Healing a community that has been broke for so many years through sound. Preserving the culture of the area. There is an Art Walk every last Sunday of the month. Come out and have fun.